With this report in Science, Jack Belliveau and his colleagues from the Massachusetts General Hospital–NMR Center demonstrated for the first time that MR imaging could be used to study the organization of cognitive functions in the human brain (1) (Fig 1). The publication of this work in 1991 marks the beginning of the new field of functional MR imaging (fMRI). Jack Belliveau, then a graduate student in Tom Brady’s laboratory at Harvard University was obsessed with the idea of mapping brain function in humans. He had seen the use of powerful experimental techniques for the mapping of brain functions in animals. His junior advisor at California Institute of Technology, David van Essen, mapped visual function in awake subhuman primates by means of electrodes implanted in the occipital cortex. Jack had a vision of developing noninvasive methods to apply to the human brain. He believed that the best technology for imaging cognitive activity appeared to be magnetoencephalography (MEG), and he thought about ways to improve MEG methods to study the human brain. 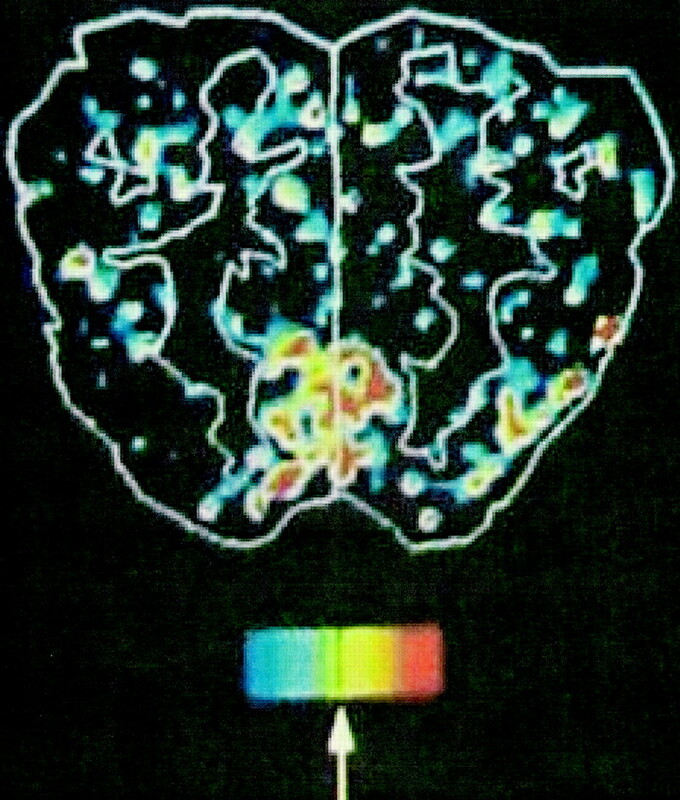 Although positron emission tomography (PET) was known to provide reliable mapping data, it failed to provide the temporal resolution that cognitive scientists desired for functional imaging studies. Jack sought a graduate student position in biophysics at the Harvard Medical School, with the intention of pursuing his interests. Published while he was in graduate school, the early articles on imaging with nuclear MR techniques suggested to Jack that they might hold the key to functional imaging. Others were skeptical. Most investigators considered MR imaging an anatomic method and used other strategies for functional imaging. Investigators at the nuclear MR laboratory at the Massachusetts General Hospital were exploring the use of contrast media for MR imaging. Initial findings showed a decrease in signal intensity in the liver as it was perfused with gadolinium-containing compounds. This unanticipated result led to a better understanding of susceptibility contrast, which was important in the development of functional MR imaging (fMRI). While most investigators at Harvard were exploring other strategies for functional imaging of the brain, Jack continued to work on the idea of using nuclear MR methods. Some initial studies with 2.0-T imaging in animals were unsuccessful. These failures were likely due to the inadequate stability of the imaging platforms at the time. Although many investigators doubted that MR imaging could provide sufficient sensitivity for the study of brain function, Jack persisted. Supported by a new investigator award from International Society for Magnetic Resonance in Medicine, he performed the in vivo human experiments with MR imaging that demonstrated neuronal activation, that is, increased blood flow in the cerebral cortex linked to the increased activity in the adjacent neurons. In 1991, Jack and his coinvestigators reported that cerebral blood flow activation could be detected with the enhanced imaging speed of echo-planar sequences and with the use of intravenously administered paramagnetic contrast media. In seven healthy subjects, they acquired 60 images in 45 seconds after the injection of gadopentetate. They repeated the acquisition and injection while the subjects viewed a flickering checkerboard pattern through goggles. The investigators measured blood flow by calculating the area under the curve on the plot of signal intensity versus time after the administration of the contrast agent. They found a significant increase in regional cerebral blood flow (rCBF) in the striate cortex in each subject during the visual task. Belliveau et al clearly showed that MR imaging could play a role in functional imaging of the brain. They predicted that fMRI would broaden our understanding of the unique structure-function relations involved in neural information processing; this prediction has been fulfilled. Investigators at Harvard were among the first to recognize that blood has its own intrinsic susceptibility contrast mechanism. In animals, changes in the signal intensity in the brain were observed as a result of cardiac arrest, changes in the rate of ventilation of the animal, or changes in deoxyhemoglobin levels. Improvements in MR imaging eventually permitted the imaging of blood oxygen–level dependent (BOLD) contrast, which is about an order of magnitude smaller than the effect of contrast medium (2% compared with 30%). Other reports on functional imaging of the brain with MR image followed. In 1992, Bandettini et al (2) demonstrated that activation secondary to finger tapping could be demonstrated with fMRI because of the BOLD effect. Subsequently, other investigators reported about activation secondary to language tasks, auditory stimulation, and higher cognitive functions. Activation in the cerebrum, cerebellum, brainstem, and spinal cord has been studied with fMRI, without the use of intravenously administered contrast medium. fMRI has changed many aspects of MR imaging practice and research. Neuroscientists and clinical neuroradiologists now perform fMRI. fMRI is the focus of many grant-supported studies and program-projects. Paradigms to evaluate various brain functions with MR imaging have been developed. Specialized software has been created to analyze images obtained with fMRI. Specialized coils and other hardware have been developed to optimize MR techniques for functional imaging. The sale of 3.0-T magnets for use in imaging has been fueled by an interest in fMRI. Although many experiments in cognitive science require highly specialized tasks and performance monitors, clinical mapping to assist neurosurgical evaluation can be performed with hardware and software that is now available with most 1.5-T machines. In many patients, fMRI is used for presurgical planning. fMRI provides a means to noninvasively map eloquent brain regions prior to surgery. fMRI can be used to estimate the risk of postoperative deficits, to select patients in whom intraoperative mapping may be needed or omitted, and to select patients a brain tumor for surgical treatment versus radiation therapy or chemotherapy. The future of fMRI is not limited to presurgical mapping. If some of the current research initiatives are productive, fMRI may play a role in the classification, monitoring, investigation, or diagnosis of psychiatric disorders. The number of fMRI studies involving psychiatric patients is growing rapidly. In general, two approaches are used: 1) the study of activation patterns secondary to task paradigms and 2) the study of functional or effective connectivity. The former has produced valuable information for the understanding of psychiatric disorders, and the latter may provide a generic method for studying many cognitive disorders. As a new MR imaging application, fMRI represents a challenge to academic and clinical neuroradiologists. Although cognitive scientists are pioneers in the application of fMRI to improve our understanding brain function, neuroradiologists must develop the expertise to apply fMRI to the diagnosis and management of neurologic disorders. To establish their role in fMRI, neuroradiologists must demonstrate competence to select patients for fMRI, to map activation with the use of some basic paradigms, and to evaluate the relationship of eloquent brain and adjacent lesions. The role of the neuroradiologist in fMRI is strengthened by the neuroradiologist-authored reports on the role of fMRI in clinical problems and cognitive science. Neuroradiologists can help expand the applications of fMRI by studying the activation patterns in various neurologic disorders. Having fulfilled one dream in 1991, Jack Belliveau has recently fulfilled another. While working with fMRI, Jack did not turn his back on MEG. In more recent experiments, he combined MEG and fMRI, using fMRI data as supplementary information in the localization of MEG sources. Using the speed of MEG and the precise localization possible with MRI, Jack succeeded in obtaining cine images of human brain activity (3), fulfilling yet another dream. Cover of the issue of Science that featured the article “Functional Mapping of the Human Visual Cortex by Magnetic Resonance Imaging” (top) and abstract of the article (bottom). Illustration from the article displays activation from the visual task.